Debian 8.0 Jessie has been released! There's a new sheriff in town. And her name is Jessie. 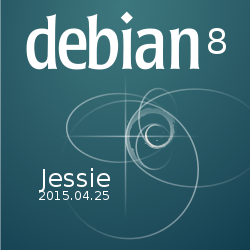 We're happy to announce the release of Debian 8.0, codenamed Jessie. Want to install it? Choose your favourite installation media among Blu-ray Discs, DVDs, CDs and USB sticks. Then read the installation manual. For cloud users Debian also offers pre-built OpenStack images ready to use. Already a happy Debian user and you only want to upgrade? You are just an apt-get dist-upgrade away from Jessie! Find how, reading the installation guide and the release notes. Do you want to celebrate the release? Share the banner from this blog in your blog or your website!